Darling is a fast growing tourist destination in South Africa. From the second you pull into this dusty station town, you'll understand exactly why. Located in a valley of golden hills in the Swartland region of South Africa's West Coast, Darling is a thoroughly charming spot with a local brewery and opportunites to go olive and wine tasting. Although Darling offers high-quality dining options, the town's main claim to fame is its most famous resident, satirist Pieter-Dirk Uys. He is perhaps better known by his alter-ego: Evita Bezuidenhout. Pieter-Dirk Uys has invested lots of time and energy in Darling, creating not only a popular cabaret venue (Evita se Perron), but also founding the Darling Trust, an organisation that promotes social upliftment through the arts. Don't miss the small museum and craft market, which, in addition to housing several hilarious satirical paintings, also displays some priceless correspondence between Evita and notable figures from South Africa's history, including Nelson Mandela, Desmond Tutu, FW de Klerk, and PW Botha. Agriculturally prosperous and blessed with plenty of sun, Darling is a must-see destination. It is a magical place where horse-carriages still canter past quaint Victorian cottages and the most stressful decision of the day is which restaurant or wine farm to try next. 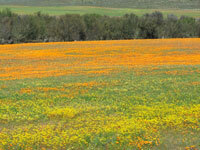 Darling is also home to an annual Wildflower Show (August to September), where the famous Namaqualand Daisies can be viewed in all their glory.